It’s time for another Mandatory movie throwdown, as we go deep with the latest against the greatest ant-inspired movies. We’re keeping the insect-action battle to the death between Rick Moranis and the 1989 classic Honey, I Shrunk the Kids and this July’s super-insect duo, Paul Rudd and Evangeline Lilly’s Ant-Man & The Wasp. Ant-Man and the Wasp has twice the number of heroes, which is great because it’d be hard to top Rick Moranis on your own. While he’s the heroic dad, he’s also the one who invented the machine that shrunk his children. So if we’re social services, we’d have to say Rudd and Lilly are the winners here. Given that Amy O’Neill was a hair under the legal age in 1989, we can’t openly say she was hotter (even though she was one of the first girls we had big boy feelings for). However, considering there were two beautiful women — both the villain (Hannah John-Kamen) and Evangeline Lilly — it makes this whole awkward position we put ourselves in a hell of a lot easier on us. 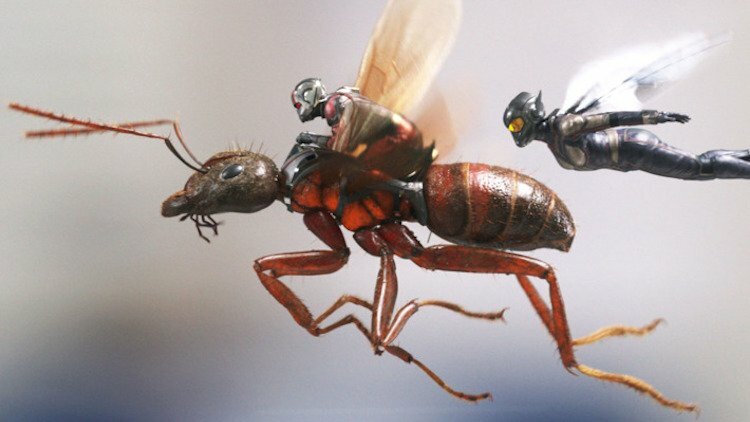 While the ants in both Ant-Man films have a cool CGI quality that do both wonderful acrobatics and allow Paul Rudd to ride around on them, we love the up-close vibe we got from HISK (even though it basically terrified us as kids). While the Marvel flick does a good job of putting you in Paul Rudd’s shrunken (or blown-up) world, the nearly 30-year-old classic really put you in the shoes of these little kids. Since there wasn’t much of a villain in the downsized cult comedy, it’s a no-contest situation. But if it helps, Hannah killed it as The Ghost. It seems like a toss-up since both are sort of peak special effects for their individual time periods. Yet, since we’re going one against the other, we have to give it to Marvel. However, the budget for Ant-Man & The Wasp was $162 million, while Honey, I Shrunk the Kids only had $18 million to play with. Maybe they win in terms of creative construction. For Marvel, the Ant-Man movies definitely deliver more original, out-of-the-box ideas than a superhero movie might imply. Chances are, a lot of those ideas are based in some ways off Honey, I Shrunk the Kids. Either way, we love movies about small people in big places (except being Downsized with Damon). Let’s just say when you’re a helpless victim in your dad’s cereal bowl, pleading for your life, it’ll make you say some fairly memorable lines. While Rudd always knows how to deliver his, this fish-in-the-milk scenario is too classic. How is this even up for debate? While Ant-Man & The Wasp has the edge on more categories, it’s a bit of a toss-up if you compare them to their relative time periods. Honey, I Shrunk the Kids remains a cult classic nearly three decades later, but will people consider Ant-Man and the Wasp a classic even three years from now? Rick Moranis, the recently departed Marcia Strassman and their no-name kids did more for timeless movies with a tiny budget than four of Hollywood’s biggest stars could do with $162 million. Plus, at the end of the day, we don’t need another damn superhero movie, even if it is the most enjoyable of the lot.